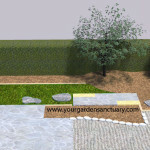 In the last couple of posts (part 1 and part 2) we started a Japanese garden design for a very narrow backyard. In those posts we have created enclosure, defined the ground plane, and began adding trees to our design. Today we will finish up with the trees as well as add some shrubs for the design. Here is how our design looked where we left off last time. (PS You can click on any of the design pictures to see a bigger version). We have a long stretch of plain yew hedge that we could leave as is, but I have decided to embellish with some more evergreen plants. We have a little over 22 feet between the Canadian hemlock in the left corner and the Japanese maple. The depth of the planting bed is about 4 feet. The first plant will be another evergreen. We will also add more than just one of them. The plant we will be adding is three dwarf Hinoki cypress (Chamaecyparis obtusa ‘Gracilis’). 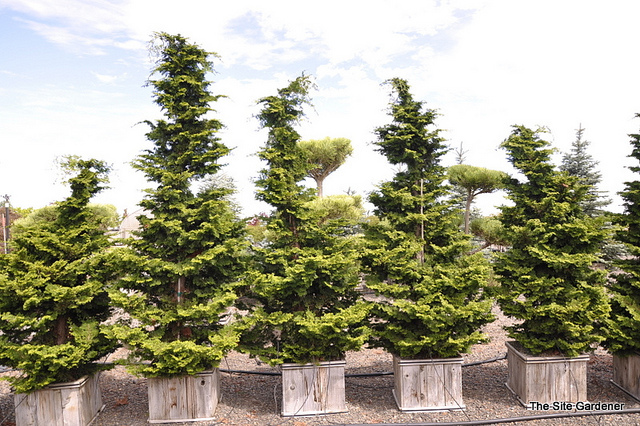 This cultivar of Hinoki cypress is an especially elegant columnar small evergreen tree. It becomes a narrow tree with layered fan like branches radiating from the trunk. It matures more gracefully than the regular Hinoki cypress. Another similar cultivar that could also be used is Koster’s False Cypress (Chamaecyparis obtusa ‘Kosteri’). We will plant them arranged not perfectly aligned, but instead with the middle one towards the front of the bed a bit and the distance between them varying a bit. 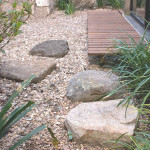 This will help to create a more natural look as we would see in nature. Here is how these Hinoki cypress would look when added to our design. We have added a lot of vertical plants to the area in front of the hedge. To finish the space, I will add a plant that is not so upright. 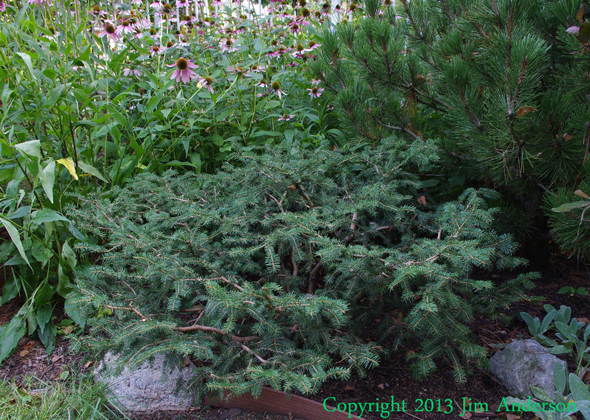 This plant will be one of my favorites, the bird’s nest spruce (Picea abies ‘Nidiformis’). I have written a post about this versatile easy care plant before. We will add three of these together in front of the hedge, but will get ones that are not all exactly the same size. We will also prune them so that they are not all exactly the same. This is to create a scene that looks natural with some variation. Yep more evergreens! I am taking that “mostly evergreen plants” recommendation from my post Japanese garden in a small yard to heart. These will be evergreen shrubs but not conifers for a change! 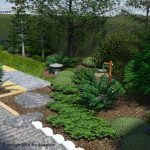 The evergreen shrubs I will be adding will be Glencoe Boxwood (Buxus ‘Glencoe’) which is a cold hardy variety that withstands the tough Midwestern winters better then most. 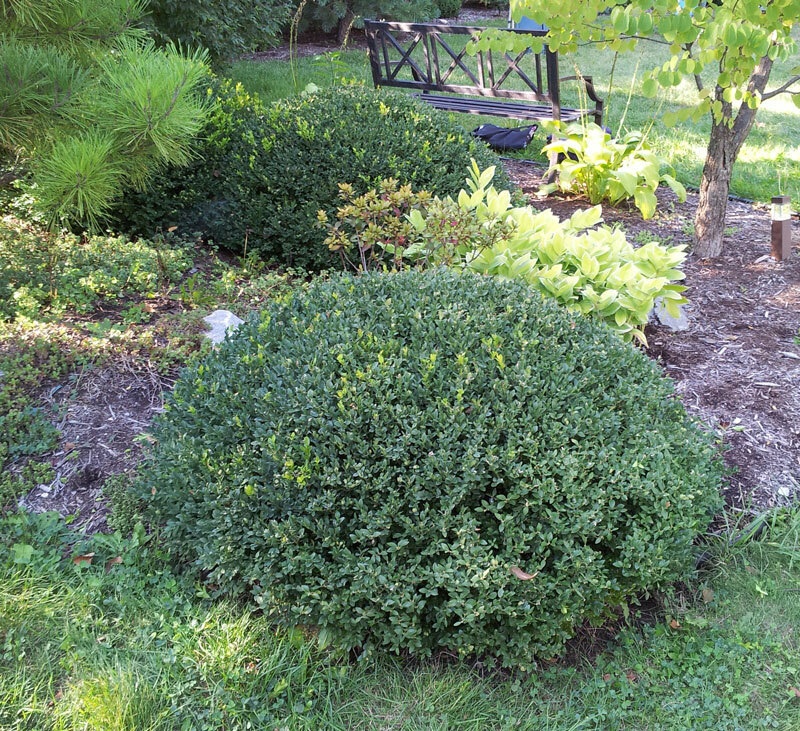 If it is not available, the more common Green Velvet boxwood (Buxus ‘Green Velvet’) will also do the job. 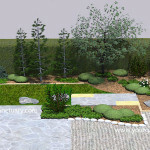 These boxwood will serve as the “tamamono” shrubs in this design. Tamamono are shrubs that are shaped in a semi-spherical way to hug the ground and act somewhat in the way a boulder does. By that I mean they help to connect the garden to the earth. These will be sheared into tight mounds that will help to “ground” the landscape as well as provide depth and repetition to the views of the garden. Next week I will take a break from this series. When we return to this series in two weeks, we will add deciduous shrubs, ground covers, and perennials. I love this so much! We are in the process of finishing our hardscaping on our bare builder lot and I can’t wait to start planting. I have many of these elements planned in our garden. I’m using hornbeam and arborvitae instead of yew for our hedges and swapping arborvitae for the boxwood because we have pets and I’m trying to make sure all the toxic stuff goes in the front yard! I especially love, love, love the bird’s nest spruce and the false cypress which I’m also planning to use along with a Korean fir because of those amazing purple pine cones. I’m also planning a thunderhead black pine even though our scheme is predominantly Mediterranean. My only concern is the climate. We are in California’s central valley which is hot and dry. I’m hoping that careful irrigation along with dense planting, good mulch and a layered canopy will enable me to get away with the bird’s nest spruce and false cypress. I’m planning to use a Japanese maple but I think I need to wait until there is some good shade cover grown up for it or it will surely cook! Do you foresee any problems with these evergreens in our hot climate and any possible solutions? They will all be planted in tree shade although we’ll be starting with mostly small 10-gallon trees so it may take a while for the full shade to arrive! Thanks for this post. I’ve been focused mostly on my trees so it’s great to start getting so many wonderful ideas for fleshing out my shrubs plan. I am glad you are enjoying this. I do think that you might want to consider some substitutions for your climate. If these specific plants are sold and used in your area go for them, but you could also consider other ones. Junipers would be a natural plant to consider for the hot and dry condition. I know that the Sullivan false cypress option would NOT work where it is dry as they like lots of atmospheric moisture. I am not sure about the other false cypress but Junipers or other plants may be better options in your climate. A Mesquite tree would be a definite possible replacement for the Japanese maple in a Hot and dry climate. A Japanese maple may do fine with proper shade and irrigation. I am sure I would use other plants in your climate as these are ones that can work in my -20 degree winters. You probably have lots of options for plant materials I could only dream about.